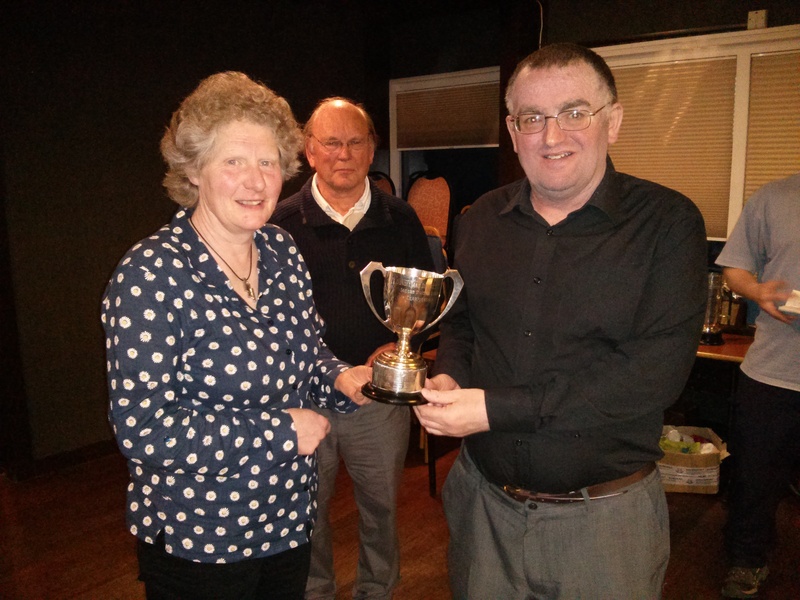 Dave Beveridge has been presented with the Graham Neilson trophy at the Annual General Meeting of the St Andrews Table Tennis Club. This cup is awarded to the most improved player in the club over the past year. It is named in honour of Graham who played with great distinction for the club for 25 years as well as serving as team secretary and Chair. Dave is the third winner, following Jonathan Fraser and Nick Shepherd. Having returned only recently to playing table tennis, Dave has progressed rapidly, displaying great energy, enthusiasm and commitment to becoming a better player and, notably, he has a strong desire to win. He has invested many hours in practice and it has paid off as he has achieved some notable victories which would not have been possible for him a year ago. Dave has also earned his coaching badges and is already imparting his knowledge of the game to others. This entry was posted in Uncategorized on May 20, 2014 by standrewstt. Elaine is pictured with clubmate and East Fife Sports Council representative, Alain Leger. 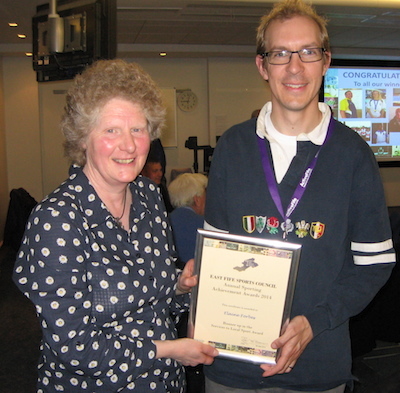 St Andrews’ Table Tennis Club stalwart, Elaine Forbes, was recognised for services to table tennis at the East Fife Sports Council 2014 Annual Awards Ceremony this week. Elaine was one of four local sports leaders and coaches shortlisted for the Scottish Association of Sports Councils’ prestigious ‘Services to Local Sport Award’, designed to mark an individual’s dedication, commitment and voluntary service to sport over a long period of time. Elaine has a distinguished history in Scottish table tennis, not least as a former six times Scottish champion. For the last 20 years and more she has freely given up her time to help coach youngsters and adults, and to act as an office bearer in St Andrews Table Tennis Club. Elaine, of course, stills plays table tennis to a very high standard and we are eager to see the New Kids pit their wits and skills up against Dundee District’s best in next season’s Division 1 competition. No pressure, Elaine. 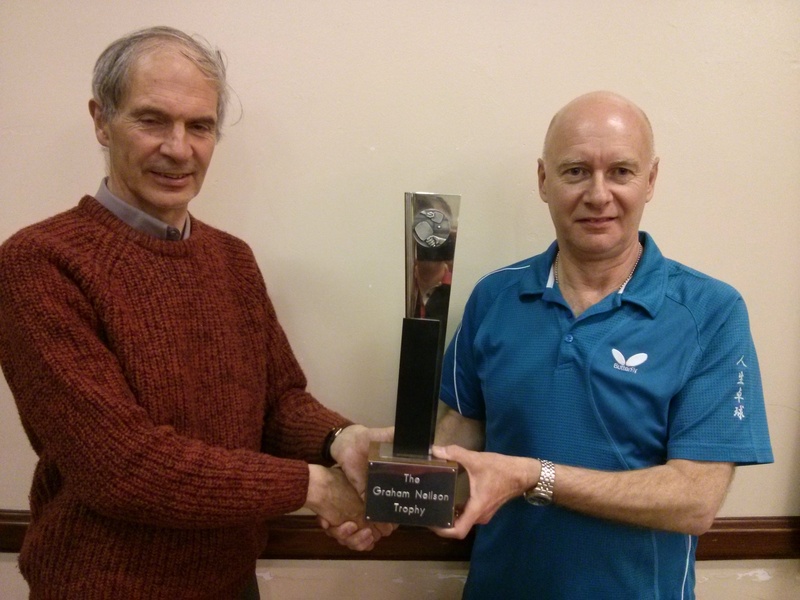 This entry was posted in St Andrews Table Tennis Club on May 9, 2014 by standrewstt. 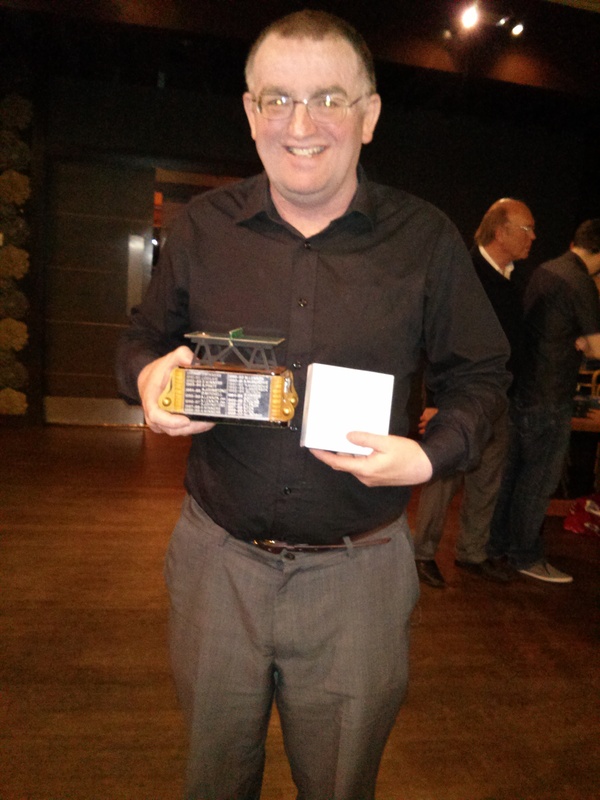 Players from the New Kids team were delighted to be presented with their trophies at the Dundee & District Table Tennis Association end of season dinner in Broughty Ferry. 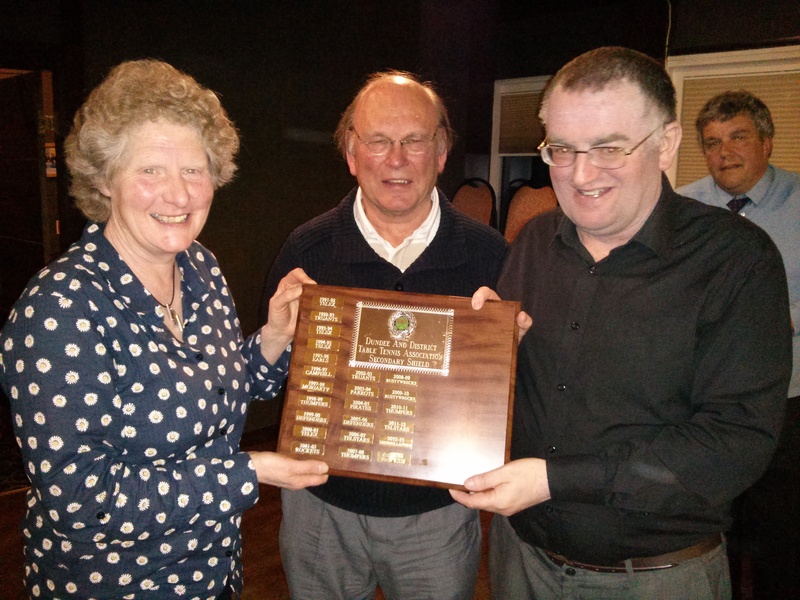 The all conquering team of Elaine Forbes, Peter Bladen and Nick Shepherd were unbeaten in Division 2 and claimed the title by a wide margin. The New Kids also won the Secondary Shield knockout competition for teams outside of Division 1. Elaine and Peter were both unbeaten in the league. No one else in any division could equal their 100% average. 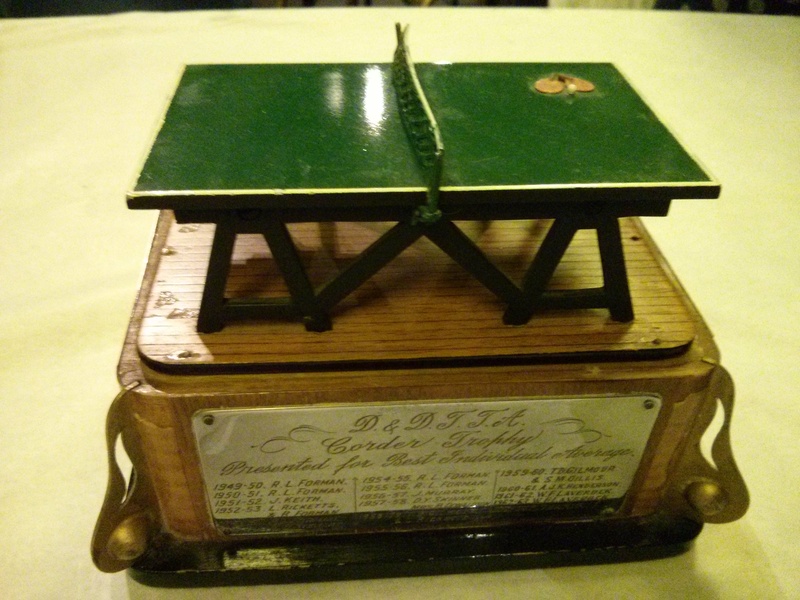 As Peter had played more fixtures, he was duly awarded the Corder trophy for the highest league average. This entry was posted in Uncategorized on May 5, 2014 by standrewstt.